If you had Notre Dame-Syracuse as the most important game on November 17th, raise your hand. If your hand is raise you’re a liar. This is the most important Shamrock game in the series. The Irish are undefeated in the previous eight games but they weren’t against an opponent like this one. In case you need a reminder, Notre Dame has defeated Washington State, Army, Maryland, Miami (Fl), Arizona State, Purdue, Boston College and Army. This year’s Syracuse team is head and shoulders above those opponents. The Orange are the most powerful offensive team the Irish will face this season. The Pitt loss is inexcusable but you can argue no one has played Clemson better in the last two regular seasons than Syracuse. In their last four games, all wins, they’ve scored 40 or more points in all and has won all of them by double digits. On offense, they’re led by duel threat quarterback, Eric Dungey. All he’s done is throw for 14 touchdown passes and run for another 12. He’s second on the team in rushing. The Irish defense must be able to keep Dungey in the pocket and force him to be a passer. They can’t allow him to be a dual threat. That would start by staying in their rush lanes and not letting the Cuse establish a running game with Mo Neal. How the Irish deals with this starts with Drue Tranquill. The Notre Dame all everything linebacker has had an incredible season despite a broken hand. The first guy who gets to the Orange ball handler must bring him down. Also, it will be interesting if the Irish will use a spy on Dungey. If so, who will it be? On offense, no matter the quarterback, the Irish can’t give this offense a short field. Syracuse is second in the ACC in sacks and interceptions. 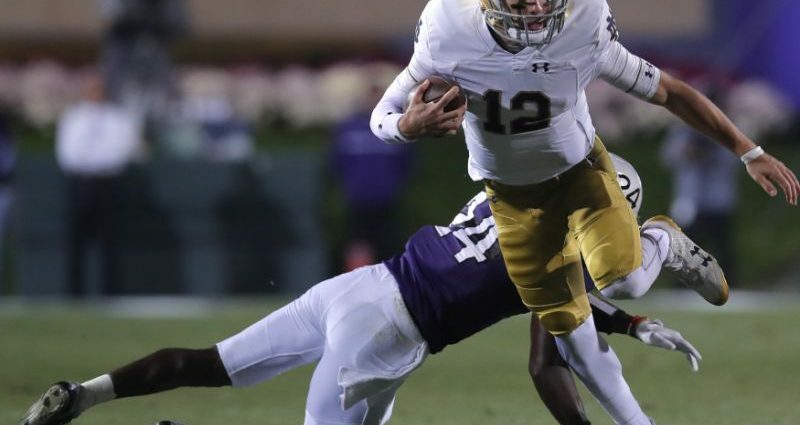 With Book being named as the starter, look for the Irish passing game to make more big plays. His ability to make pre-snap reads will be key to dealing with the rush. Dexter Williams ability to find the rushing lanes opened up by one of the best offensive lines in the country. Since coming back from a four game suspension, Williams has rushed for 100+ yards four times including a 202 yard performance against Florida State. Notre Dame has done a lot of traveling of late and this has brought up whether giving up a home game is worth continuing the Shamrock Series. But that’s a conversation for another day. The Irish are two games from being undefeated and a possible spot in playoffs. They have two steps left… very large ones.